Images from apps and sites created with in5. This course will teach you how to use InDesign and in5 to create beautiful and accessible sites and mobile apps. Learn to become a master of digital publishing from the ground up by using familiar design tools. For full course details, visit the main course page. A solid layout and great graphics are a good start, but interactivity will help your website or app engage viewers. In this lesson, Keith Gilbert will help you take designs to the next level. Today’s lesson should take approximately 20 minutes. Be sure to watch the video at the end to see all of the interactivity in action. In addition to supporting multi-state objects, buttons and forms, hyperlinks, and the animation and timing panels, in5 also supports interactive DPS “overlays”. As of in5 3.3, you no longer need to install the Overlays panel. in5 comes with it's own replacements found under in5 > Interactive Widgets. 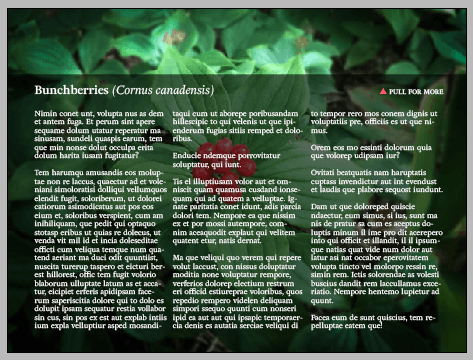 These panels will let you create additional interactivity from InDesign that you cannot create any other way. If you have an older version of in5, you may still be able to install the Overlays panel using this link for Mac (or Windows). 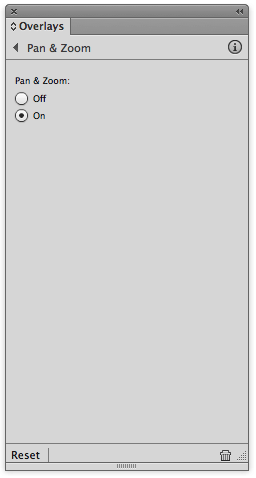 If you attempt to poke around this panel, you’ll see that you can’t access most of it’s options. That’s because this panel only becomes useful after you’ve done some other things first. Keep reading, and I’ll show you how. 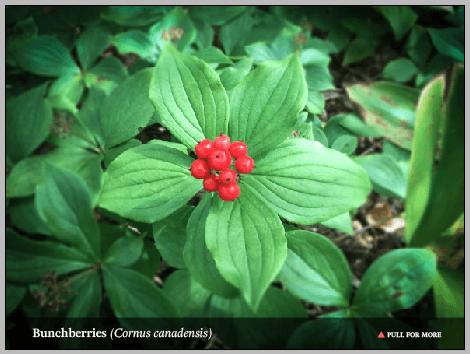 Slideshows can be created with just a combination of multi-state objects and buttons, as explained in another tutorial. But the DPS Slideshow overlay adds some additional capabilities to slideshows. 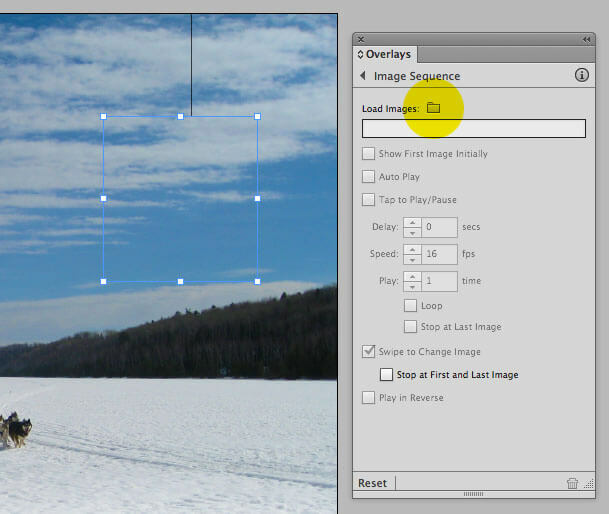 To create a slideshow overlay, just select a multi-state object with the Selection tool, and open in5 > Interactive Widgets > Slideshow (or click Slideshow in the Overlays panel). If you select this option, the slideshow will begin to play automatically when it appears on the screen. This can be used not only for slideshows, but for creating very simple, low-frame-rate animation. 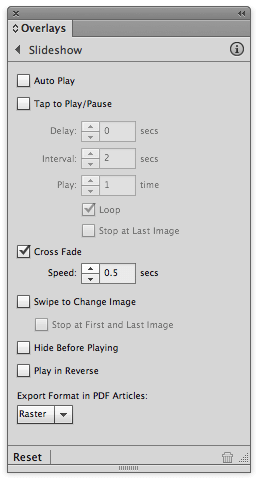 When this option is selected, the Delay, Interval, Play, Loop, and Stop at Last image options become available. This allows the user to tap the slideshow to cause it to begin playing, or to pause the playback. This can be set to any value between .125 and 60 seconds. This is how quickly a slide transitions into the next slide. Slideshows created without the Overlays panel have no transition between slides. Setting a transition speed of .5 seconds or so provides for a nice fluid movement between slides. This allows the user to swipe to navigate from image to image in the slideshow. Note: The Export Format in PDF Articles setting has no affect on in5 output. More information about these and the other settings in this panel can be found in this section of the DPS on-line help. Image sequences are extremely versatile, and very useful. An image sequence is simply a series of two or more jpeg or png images that can be set to either play automatically, or play as the user scrubs across a frame. Allow fluid user interaction with a group of images. For example, a subject can be placed on a turntable, and then be photographed every 5° or so as it spins. Each image is then saved as a jpeg. As the user swipes across the image sequence, they can then “spin” the image. 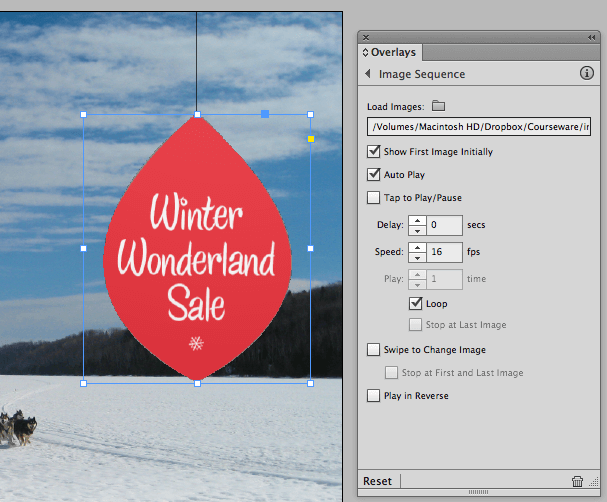 Create animated or video effects with a transparent background, since each png image can have a transparent background. Photoshop, After Effects, and Adobe Animate are some of the tools in Creative Cloud that can output a series of numbered jpeg or png images from video or animated content. 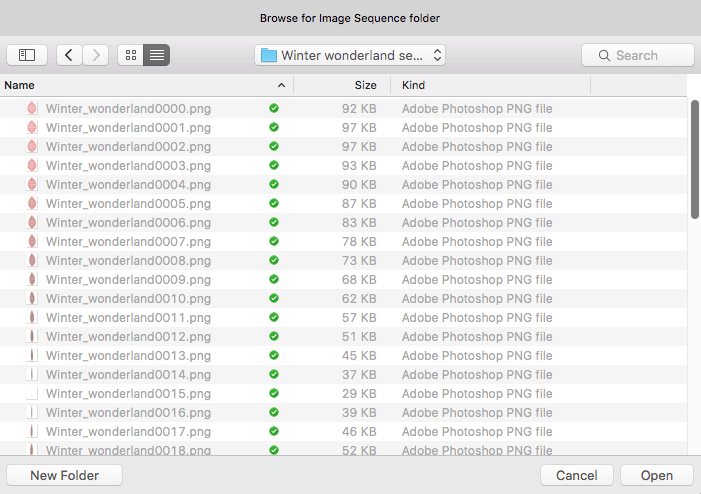 The images must be numbered sequentially with the same number of digits, e.g., file001.png, file002.png, file003.png, etc. Save images as compressed JPG images, with as much compression as possible while still achieving the quality you desire. Use 24 bit PNG format if your images must have a transparent background. Use the fewest number of images you can get by with while still achieving a smooth sequence. 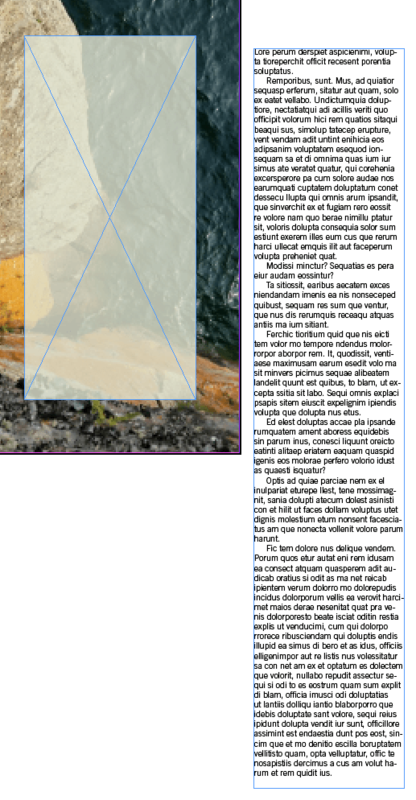 Draw a frame on your InDesign page. The size of the frame doesn’t matter. It will be automatically resized to fit your image sequence content in the next step. With the frame you just drew selected, open in5 > Interactive Widgets > Image Sequence (or choose Image Sequence in the Overlays panel). Click the folder icon next to Load Images, locate the folder containing your jpeg or png images, and open it. Position the image where you want it on the screen. Set the options in the Overlays panel as desired. More information about these options can be found here. The Scrollable Frame overlay is an easy way to add text that scrolls within a frame to an in5 page. And, this type of object is quite versatile and useful. Create the text that you want to scroll, in a long text frame. The text must not be overset in the frame. 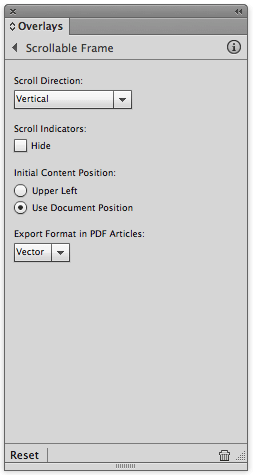 You may need to increase the size of the pasteboard in InDesign’s Preferences to accommodate the long frame. Create a second frame that will be the “container” frame that the text is going to scroll within. This frame may have a background color, stroke, transparency, etc. Position the text frame over the container frame where you want it to be positioned at the start. Cut the text frame (Edit > Cut). Select the container frame, and choose Edit > Paste Into. With the container frame selected, in5 > Interactive Widgets > Scrolling Frame (or choose Scrollable Frame in the Overlays panel). Set the Scrollable Frame options as shown below. With a little ingenuity, this same technique can be used to create an infinite variety of “tabs” or “drawers” that pull out from the top, bottom, left, or right sides of the screen. The Pan & Zoom overlay is simple to create. Just place an image on the page, select the frame, choose in5 > Interactive Widgets > Pan and Zoom (or Pan & Zoom from the Overlays panel), and turn Pan & Zoom On. Draw a frame on the page, and with the frame selected, choose in5 > Interactive Widgets > Slideshow (or Web Content in the Overlays panel). Alternatively, if your source application (e.g., Adobe Animate or Tumult Hype) creates an OAM file, you can simply use File > Place to insert your content. You don't even need the Overlays panel installed to use this method. 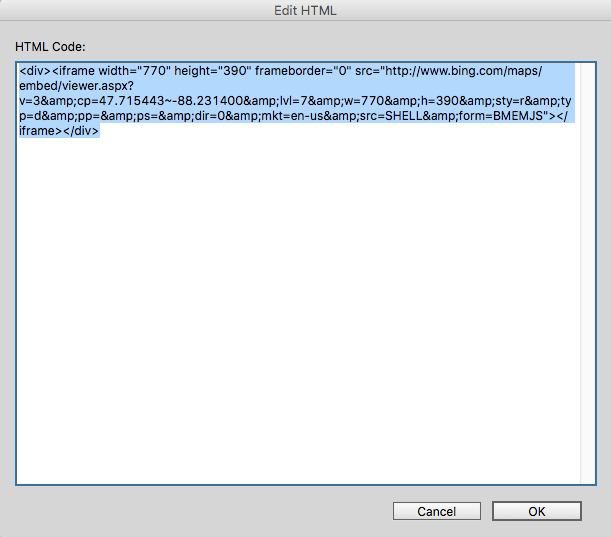 Using a site such as Bing maps, generate an "embed code" at the appropriate dimensions for your page. Copy this embed code to the clipboard. 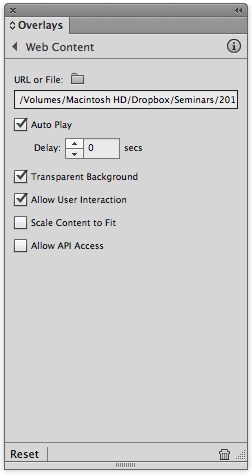 In the dialog box that appears, paste in your embed code, and click OK. Choose in5 > Interactive Widgets > Web Content (or Web Content in the Overlays panel). Fill in the panel options as show below. So if you are looking for ways to include meaningful interaction in your projects, don’t overlook the refinements to slideshows that are made possible with the Overlays panel, as well as the entirely unique Image Sequence, Scrollable Frame, and Web Content interactivity made possible with this panel. Check out this video demonstrating all of the Overlays on an iPad. You can also view the sample project online. 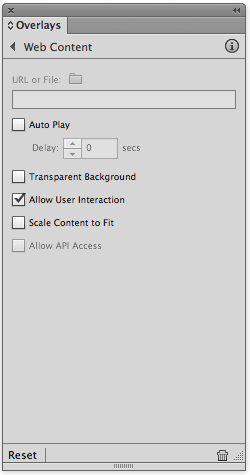 Overlays let you quickly add sophisticated interactions. An MSO can become a slideshow with a couple of clicks. A Scrolling Frame is just a simple copy and paste away. You can load live content from other sites into your site or app. 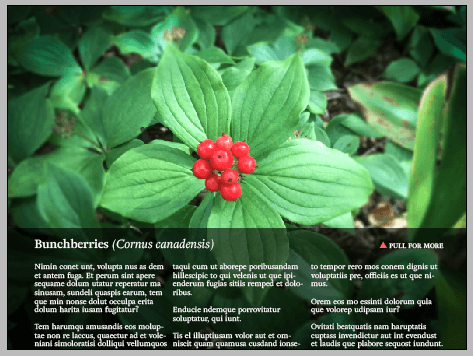 For more on Overlays and advanced interaction, check out Keith's Adobe Digital Publishing Suite Interactive Techniques or InDesign: Fixed-Layout EPUB Interactive Techniques & Publish Online courses on Lynda.com. Too much to digest all at once? You can get the VIP edition delivered to your inbox. Newsletter | Legal Notices | © Ajar Productions 2004-2019, All rights reserved.